Devils Fork and Devils Bathtub Loop Trail is a 7.3 mile moderately trafficked loop trail located near Fort Blackmore, Virginia that features a waterfall and is rated as difficult. The trail offers a number of activity options and is accessible year-round. Dogs are also able to use this trail. 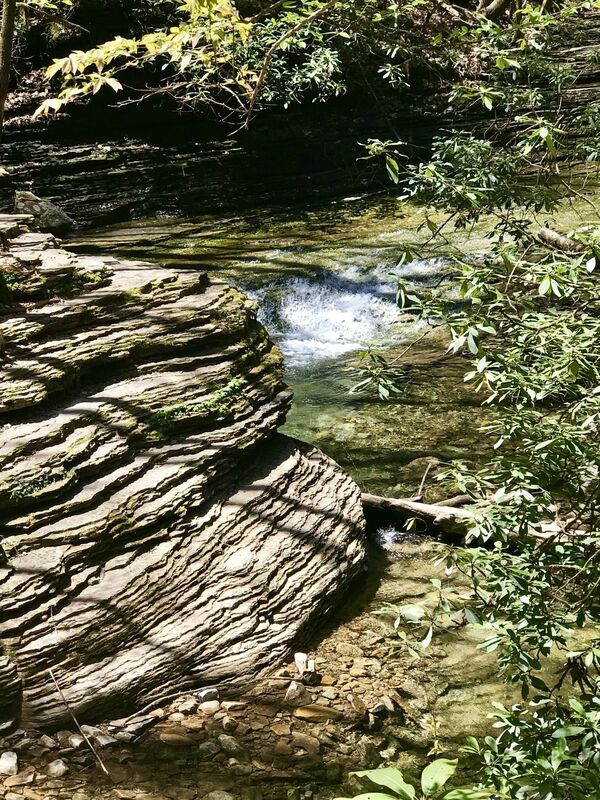 Scenic hike to the Devil's Bathtub, a scoured rock formation within Devil's Fork Creek. 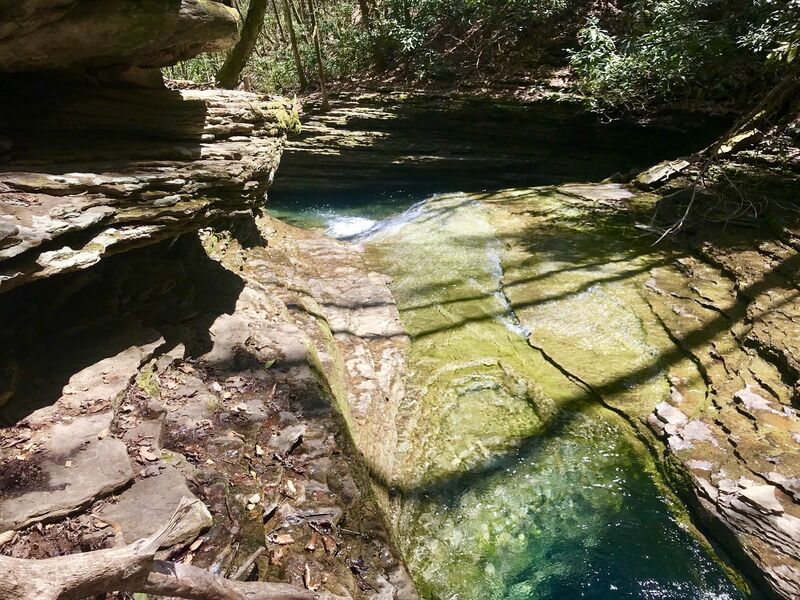 Hike follows the creek closely along its entire course, crossing the creek multiple times and passing several scenic swimming holes, rock formations, and waterfalls. 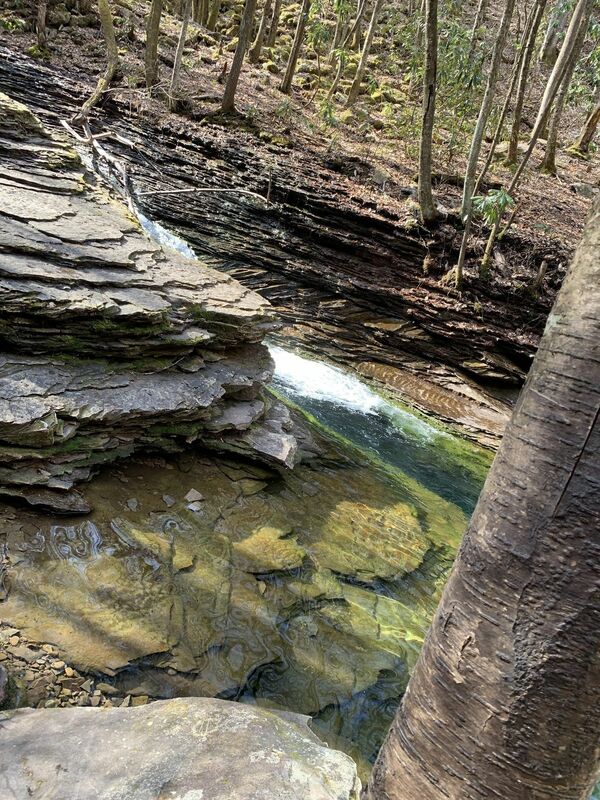 This hike continues beyond the Devil's Bathtub, climbing the mountain and returning to the original trailhead. Beyond the Bathtub, however, the trail is much less maintained and may be difficult to follow in some seasons. 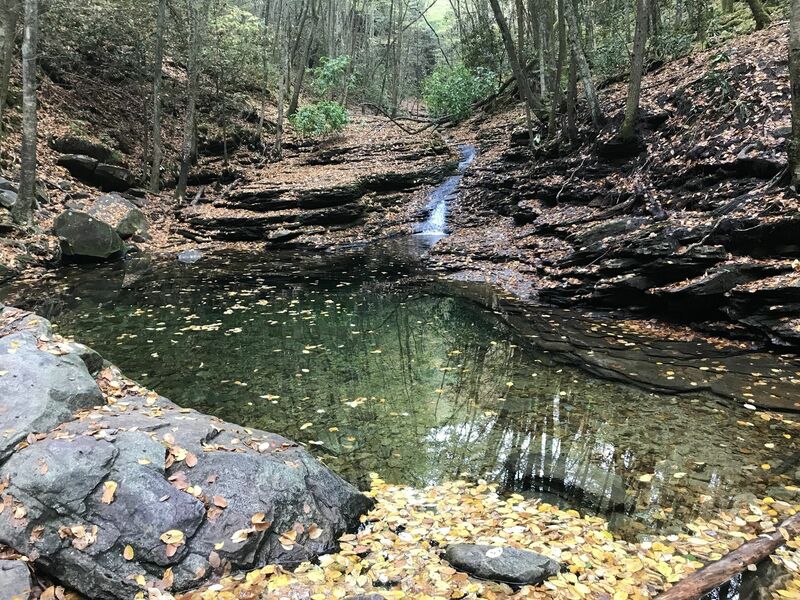 Overcrowding at the Devil's Bathtub has become a problem, exacerbated by disrespectful hikers ignoring No Trespassing signs and parking along private property when the trailhead parking area becomes full. Please be aware that ALL areas outside of the signed parking area at the trailhead should be considered private property and should not be used for parking. Access to the trailhead is only allowed through an easement from a private landowner, and disregard for property owners' rights by visitors does nothing but needlessly strain this relationship...and puts you at risk of getting your car towed. If you arrive at the trailhead and the parking area is full, consider going somewhere else rather than breaking local trespassing laws. The Bathtub will still be there on another day, and you won't have to fight crowds of people to see it. 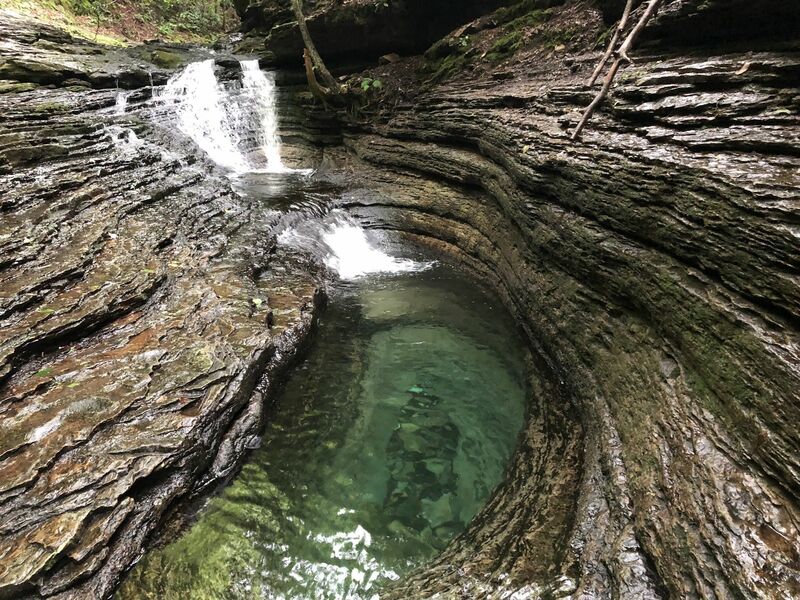 Little Stony Falls or the Guest River Gorge are alternative hikes, both of which are nearby, have similar scenery than the Bathtub, and are virtually never crowded. The road to the main trailhead can be rutted and muddy in poor weather conditions. Those without high clearance and four-wheel drive may wish to park along the first few hundred years of roadway and walk in. Trail crosses briefly to island - follow blazes. 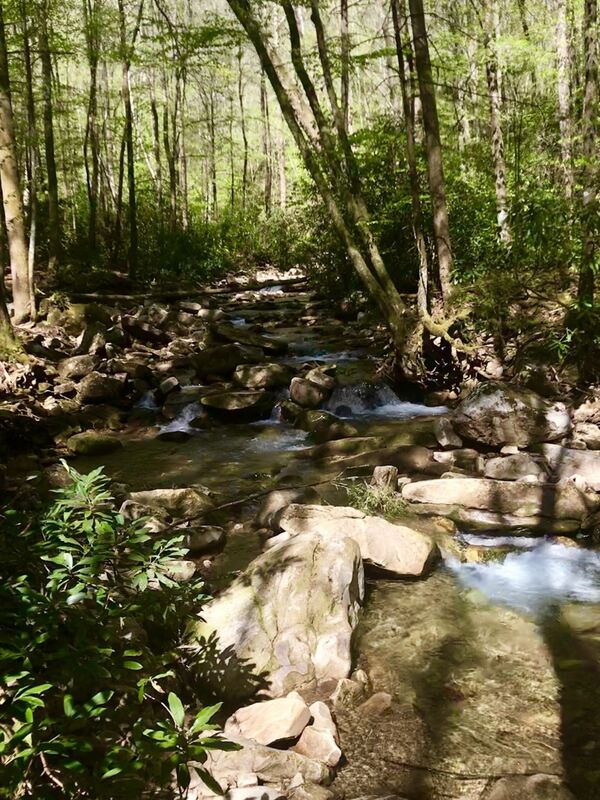 Take a look at the streamside forest as you hike this section of trail. Is it open, dry and sunny or moist, cool and shaded? 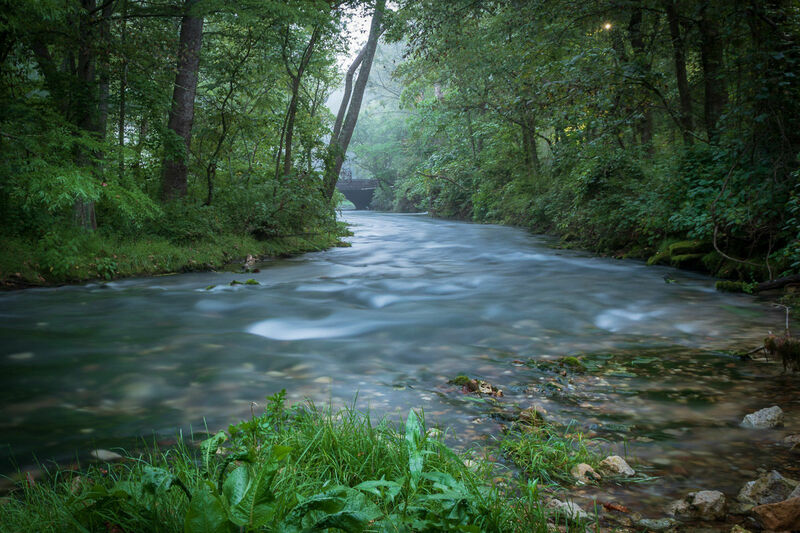 Streamside forests such as the one you are traversing are often called riparian zones by ecologists, a term that refers to vegetation occurring in close proximity to water. Riparian zones often have their own unique assemblages of plants and animals and can sometimes be difficult to define in areas where no sharp transition occurs between aquatic and terrestrial (dry land) habitats. Here in Appalachia, however, this transition is easy to distinguish. Steep cliffs and bluffs hemming in the Devil's Fork serve as a sharp boundary between habitat types, separating the moist riparian zone you are walking through from the much drier, oak and pine-dominated forest above you and well beyond the stream. 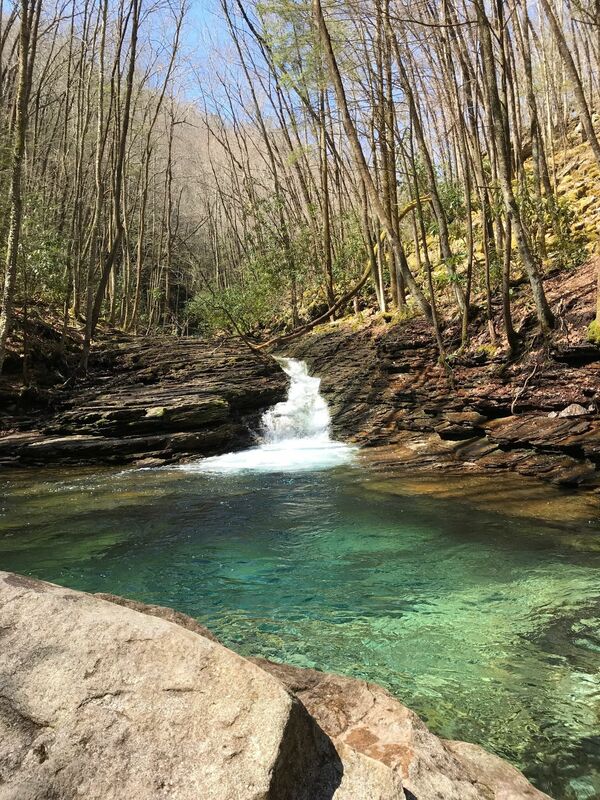 Look specifically for tree species such as Eastern Hemlocks as you hike this stretch of trail, then think about more mountaintop forests far from water. Do you tend to see these evergreen trees in much drier, nonriparian forests? 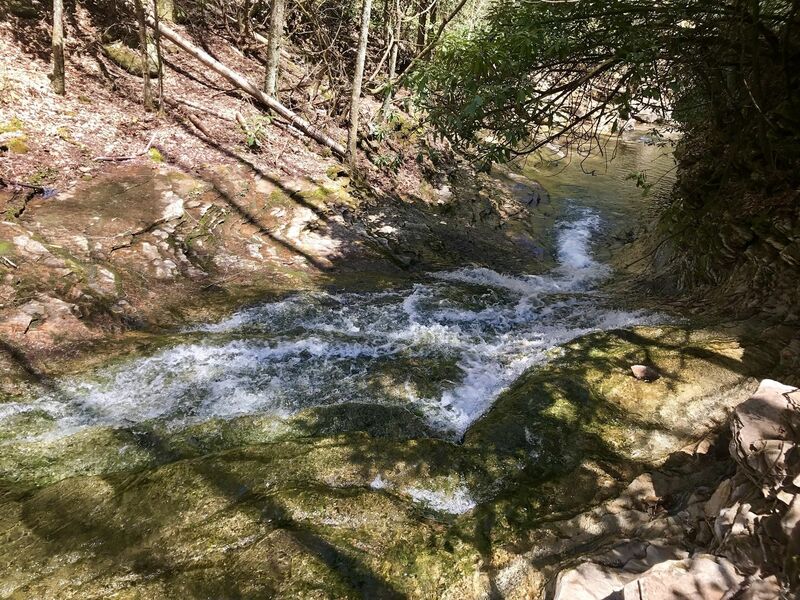 Trail enters creekbed and follows stream directly upstream for a short distance before returning to bank. Riparian zones such as the one you are traveling now (see the riparian placeholder downstream) are more than just special zones of vegetation. 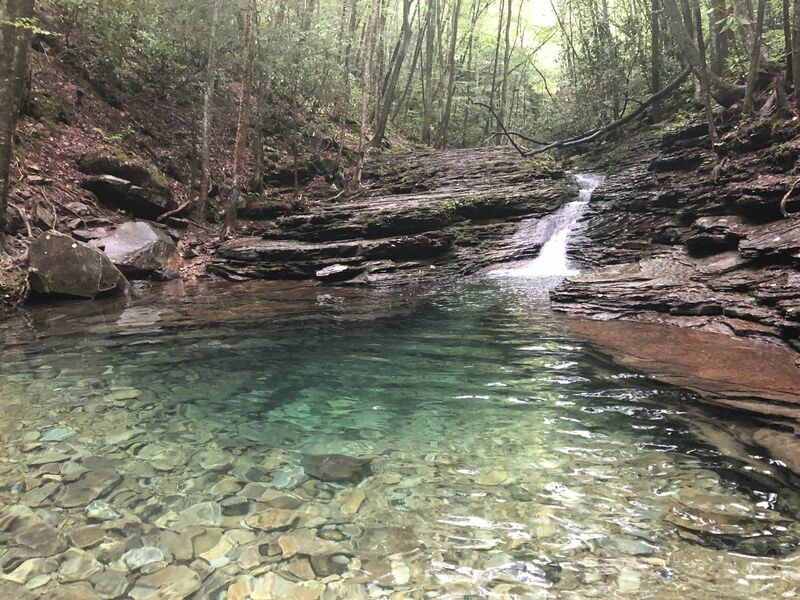 These streamside zones also serve as corridors for the movement of animals and humans alike and, in many cases, have shaped the very trajectories of wildlife and human populations in Appalachia. Think about why this might be the case. 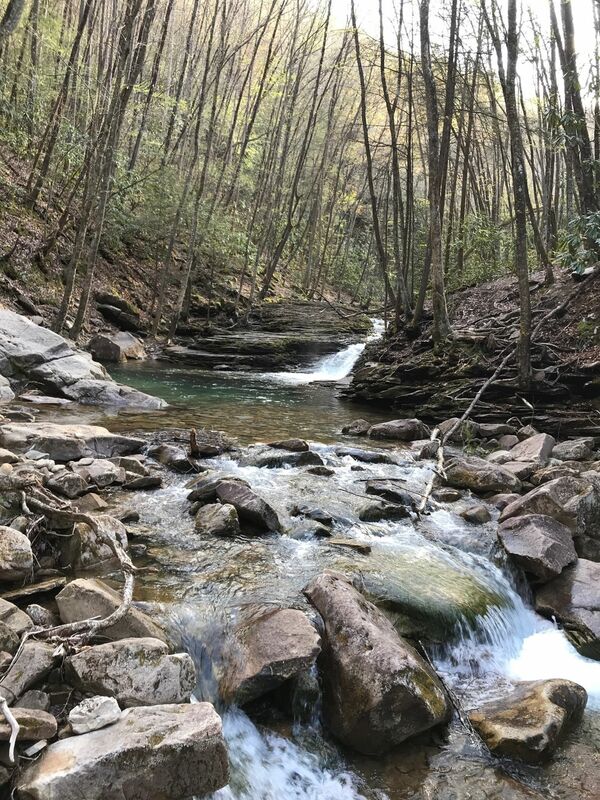 Off-trail travel through the mountains can be arduous and treacherous, especially in areas such as southwest Virginia where mountain peaks become exceedingly steep and sharp cliffs are common features in the landscape. 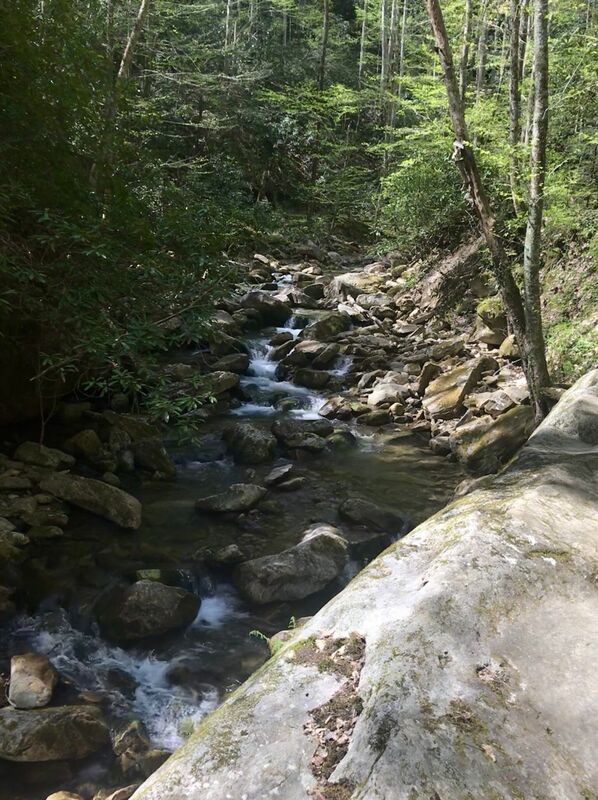 Stream corridors are therefore interstate highways of sorts for forest wildlife, since following the path of water cut by a stream typically bypasses steep terrain and sharp cliffs. 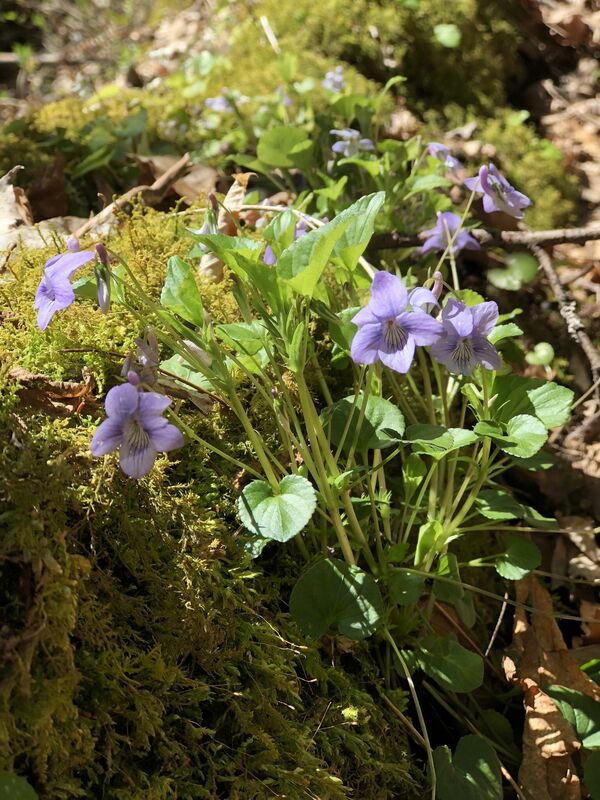 Black bears and white-tailed deer - and even earlier prehistoric megafauna such as mastodons, mammoths, and musk ox - make use of these corridors as highways through the Appalachians' rugged terrain, moving individuals and their genes across the landscape. Wild animals, though, are not the only creatures to make use of riparian zones for movement. 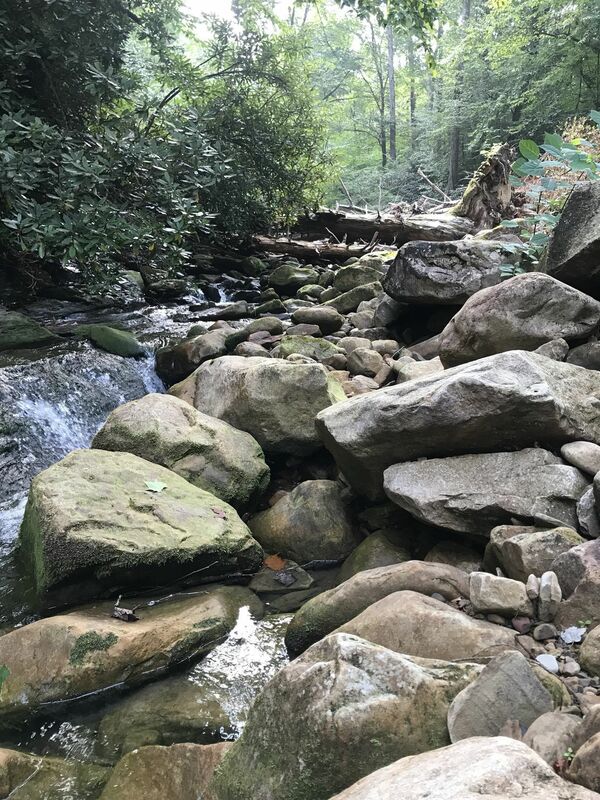 Many Native American paths in Appalachia, for example, followed stream corridors, and the trail you are hiking now was once a roadbed that followed the Devil's Fork for the same reason Native Americans and wild animals thousands of years ago did the same - ease of travel. In the case of modern humans, this particular stream corridor allowed for ease in transporting natural resources out of the surrounding watershed, and other such corridors all across the mountains allowed for early human populations to move throughout the mountains and establish settlements in otherwise rugged terrain. One such example of how human and animal movement overlap along riparian corridors can be found an hour to the north of the Devil's Fork, near the modern-day town of Saltville. 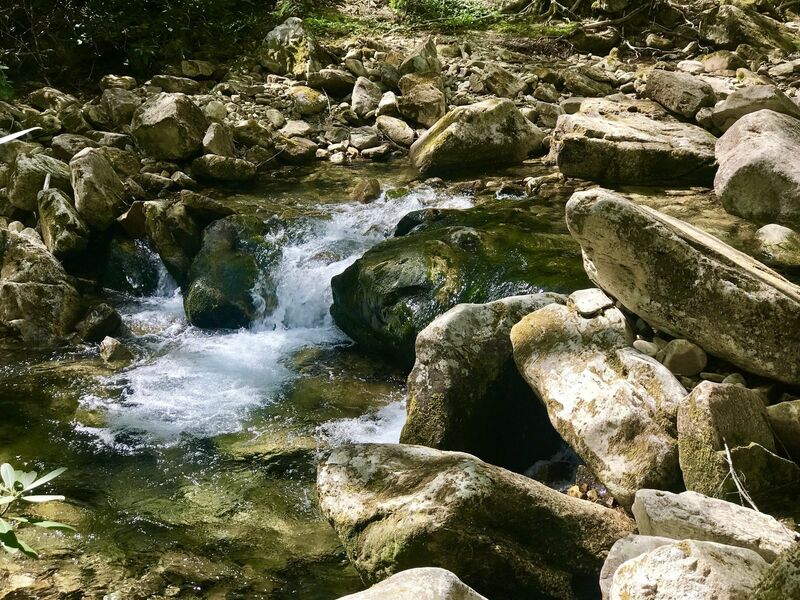 15,000 years ago, Saltville was located along an ancient river system that bisected the mountains, providing both prehistoric megafauna and human populations with routes into what is now the Saltville Valley. 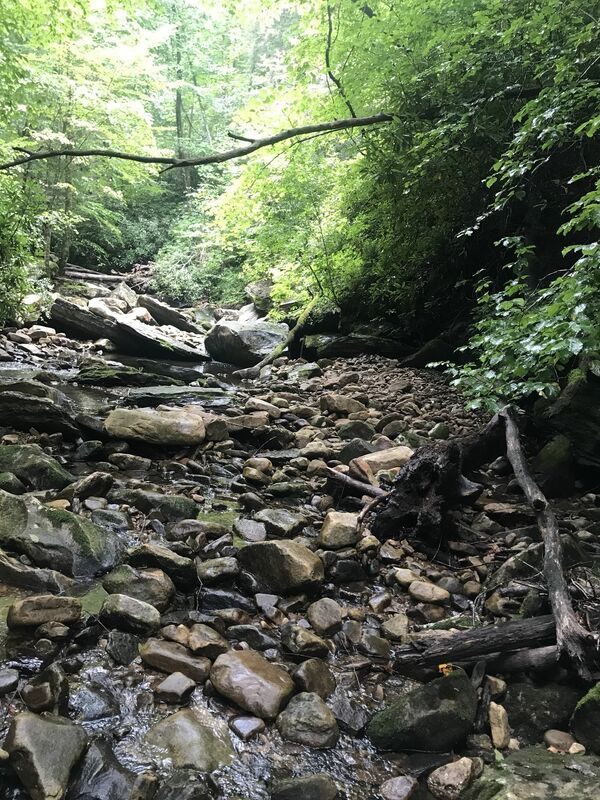 Excavations of what were once ancient wetlands along this river have shown that this corridor brought early human populations and wildlife together, as evidence exists from Saltville of humans butchering and cooking large megafauna hunted along the river corridor. Some experts even believe that hunting by humans may have contributed to the extinction of some of these species, thanks in part to the evidence found from Saltville. 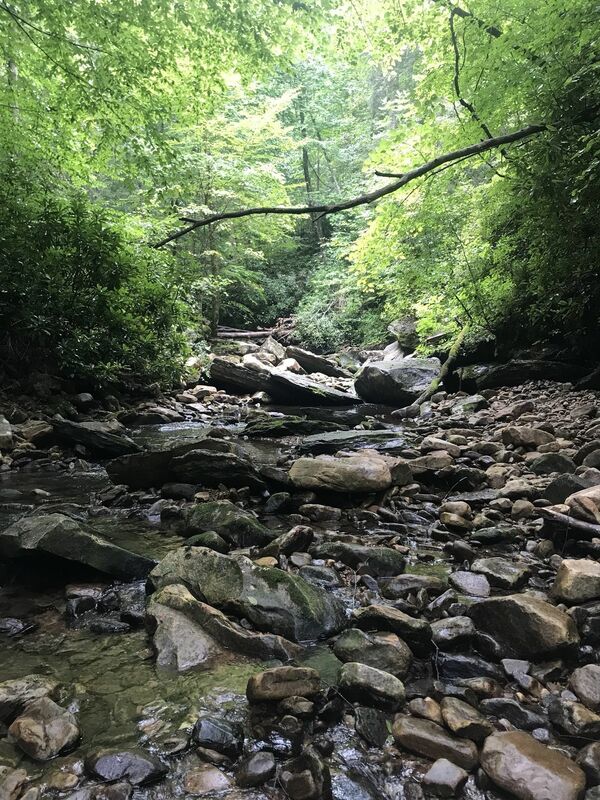 Although it may be hard to see today along the Devil's Fork, streams like these have incredibly important roles in Appalachia, both in the past and in the present. These roles are so important, in fact, that many biologists now stress preserving existing riparian corridors in order to preserve the modern-day wildlife that rely on them today, keeping movement and gene flow (the movement of genes from one population to the next) intact. 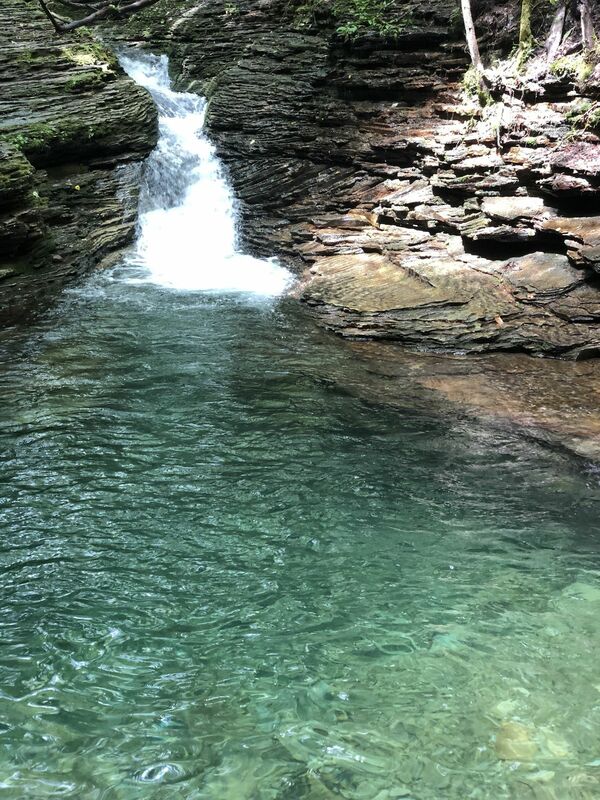 An incredibly scenic swimming hole and waterfall here are often mistaken for the Devil's Bathtub, which is actually located just upstream. 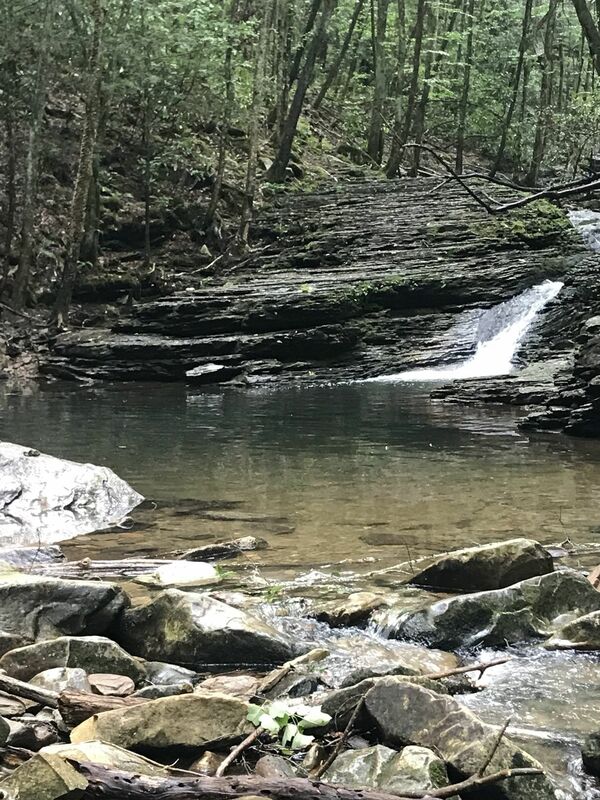 Although not the trail's main feature, the waterfall and swimming hole provide a wonderful introduction to the processes shaping the Bathtub itself. 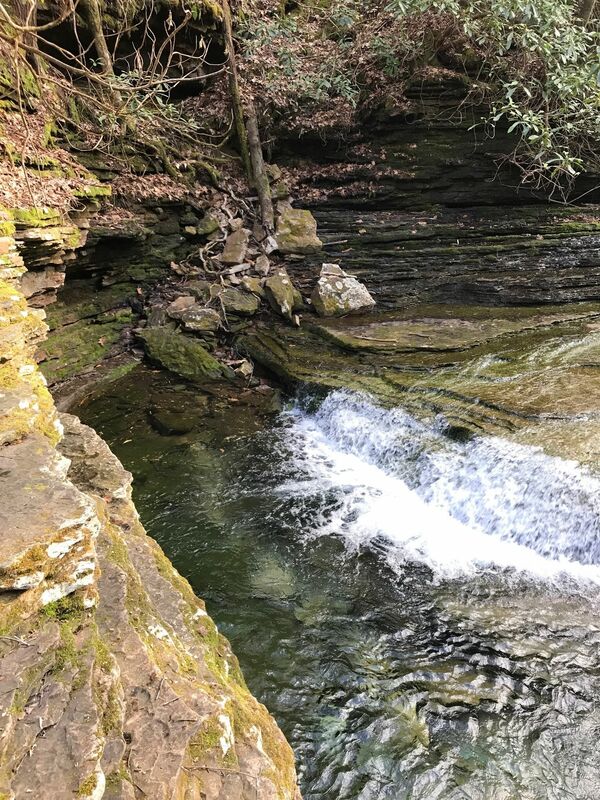 The area surrounding the Bathtub is underlain by sandstone and shale rocks - two rock types that are easily eroded by the action of continuously flowing water. 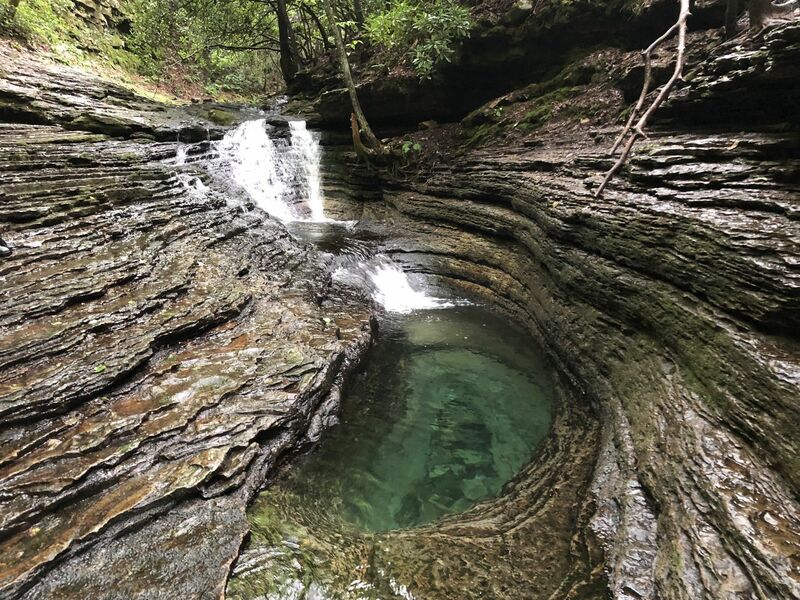 This action has scoured the channels and pools you see here over untold centuries, eventually creating the fascinating features that form the highlight of this hike. 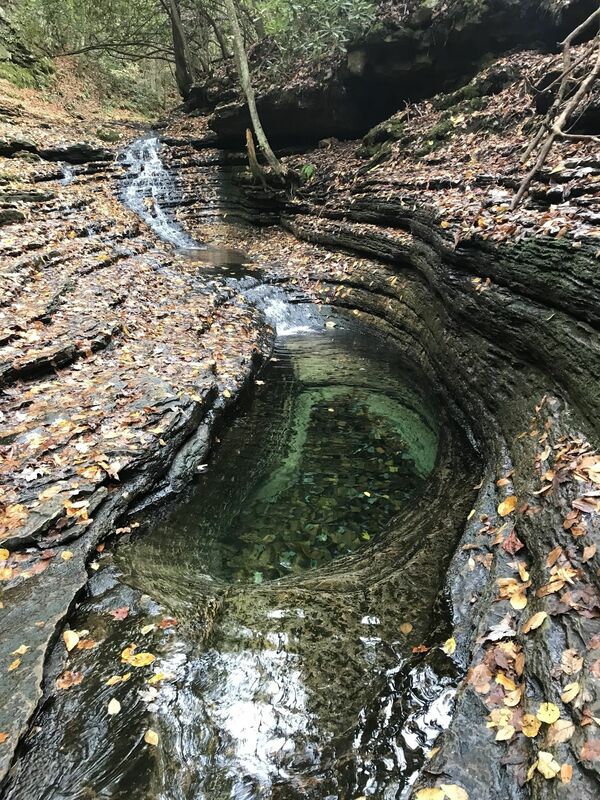 Commonly mistaken for a pool just downstream, the Devil's Bathtub is a small but surprisingly deep pool that looks remarkably like the smooth, curved sides of an actual bathtub. 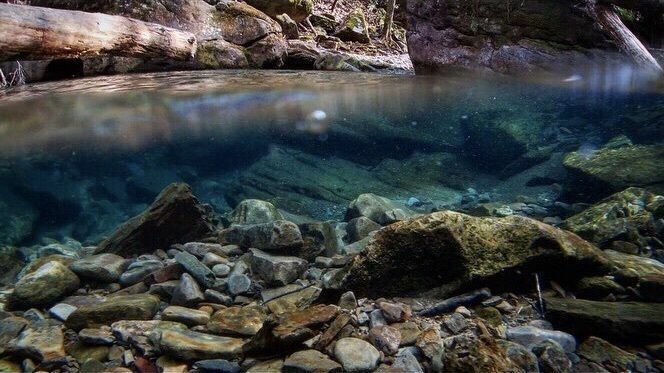 To see both the remarkably clear water of the Devil's Fork and the depth of the Bathtub itself. 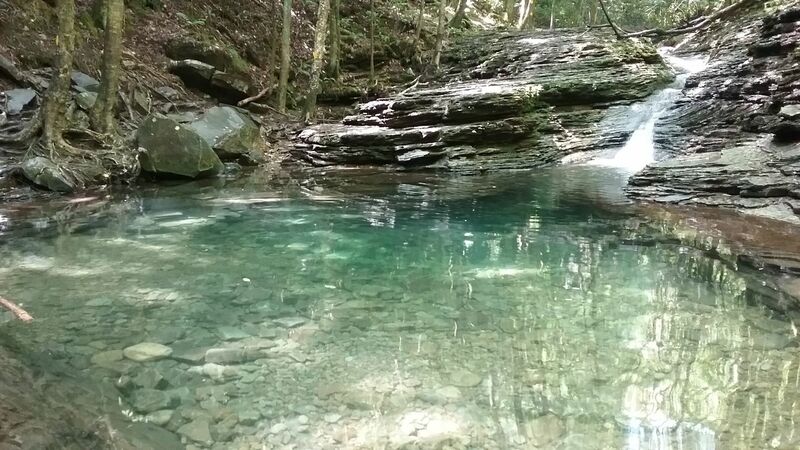 Many visitors to the Devil's Bathtub remark about the "strange" color of the water, which often appears as a bluish or even turquoise hue. 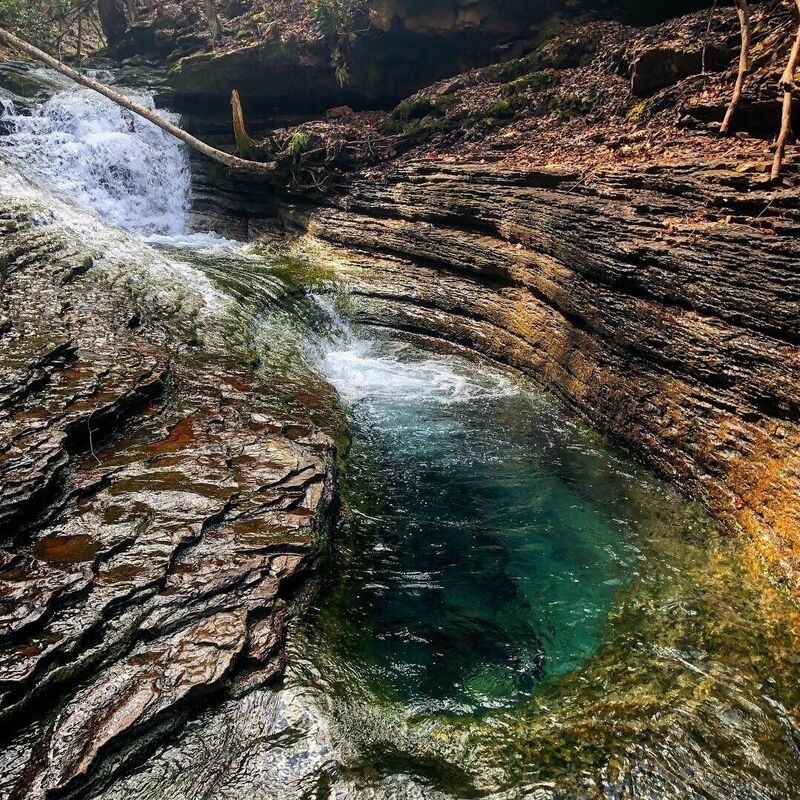 Although many factors combine to cause water color, the hue of the Devil's Fork is caused by the same rock formations that have allowed the Bathtub to be scoured. 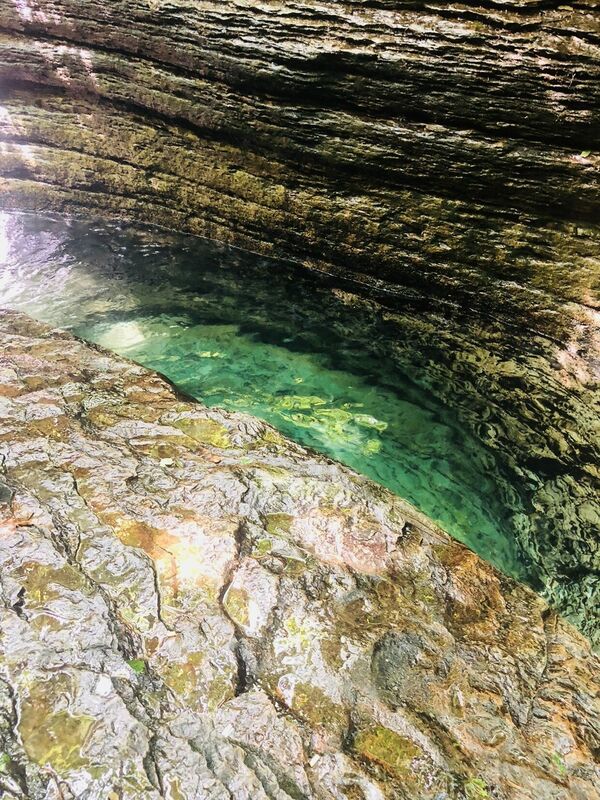 As water erodes rock, rock particles become solutes dissolved in the water itself, scattering light and producing the blue-green color characteristic of the Bathtub and surrounding pools. 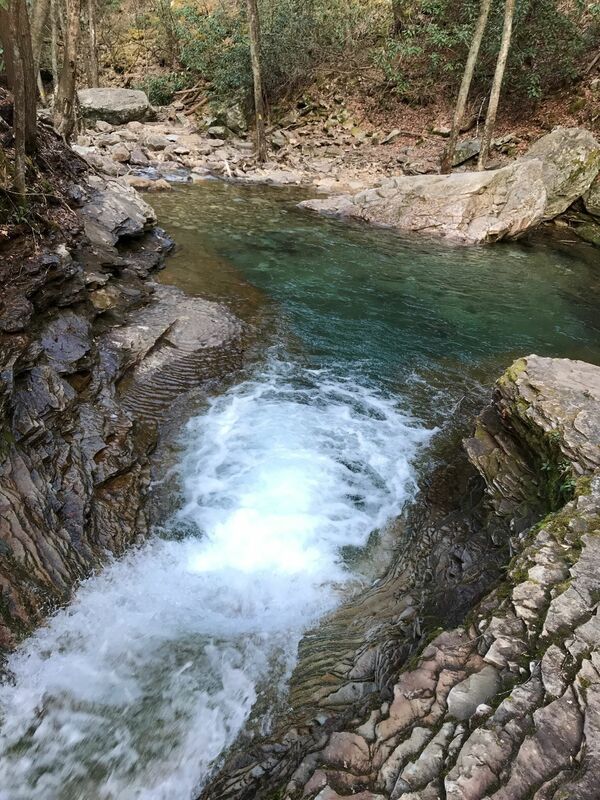 This color does not necessarily indicate clean water, though, so be sure not to drink directly from this or other streams in the region without first treating water to remove disease-causing microorganisms. 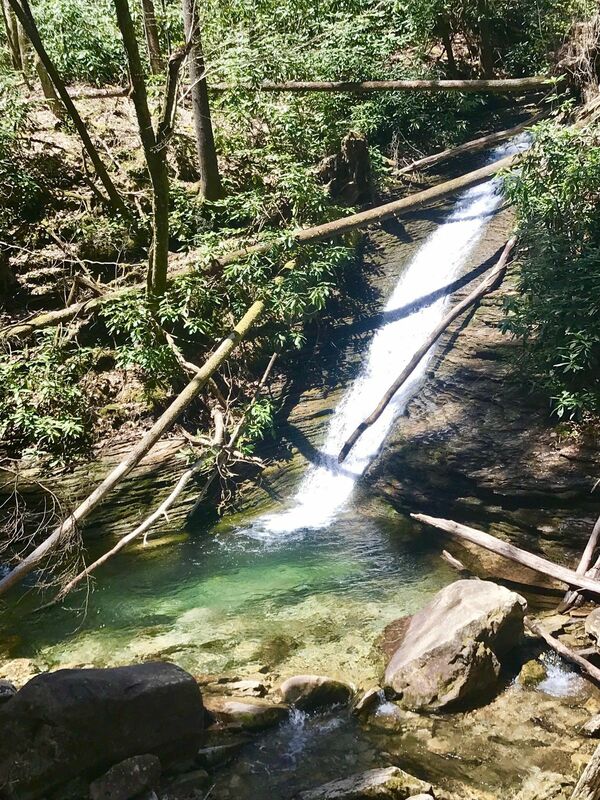 The Devil's Fork Loop Trail continues beyond the Devil's Bathtub, climbing up a tributary stream in Corder Hollow, reaching the ridge, and looping back to the trailhead for a total of approximately 7 miles. The trail becomes substantially less-maintained beyond the Bathtub itself. 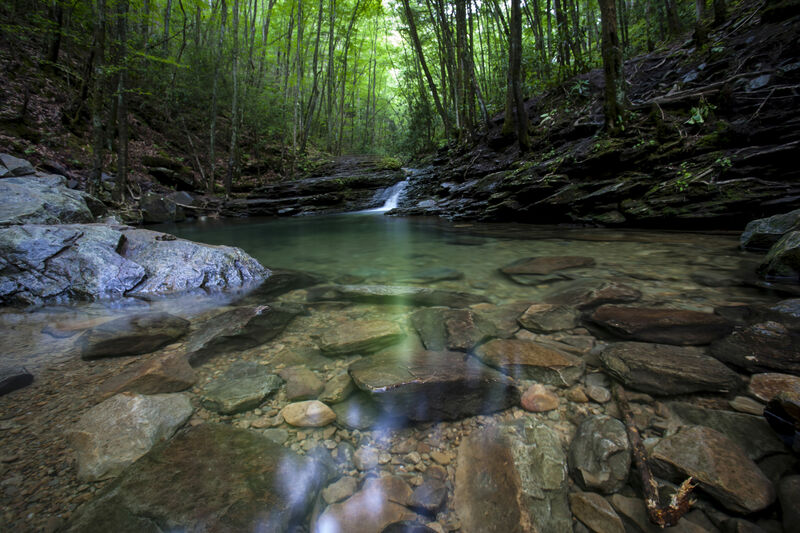 If you are day hiking to the Bathtub and do not wish to continue on the loop, simply retrace your steps back to the original trailhead. 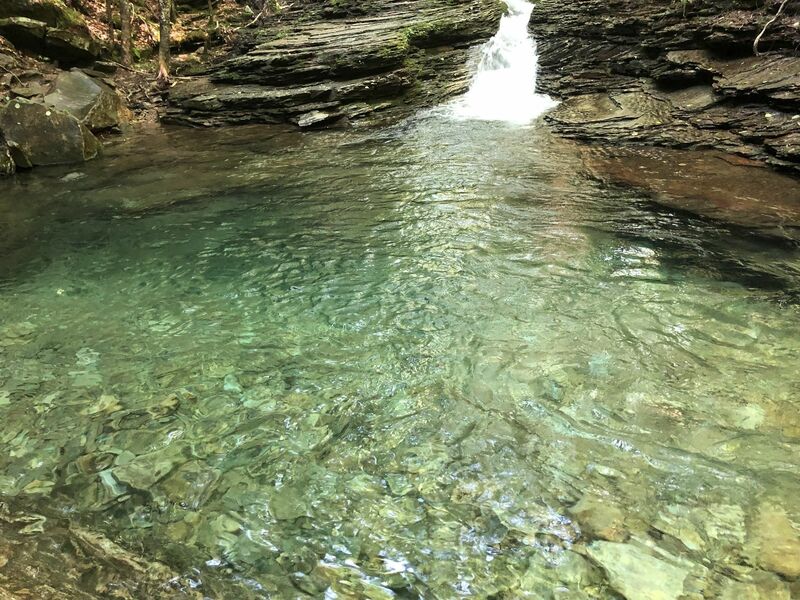 - Getting to the Bathtub is not an easy stroll to a swimming hole - it is a difficult backcountry hike involving some skill at route-finding and multiple stream crossings. People can (and frequently do!) 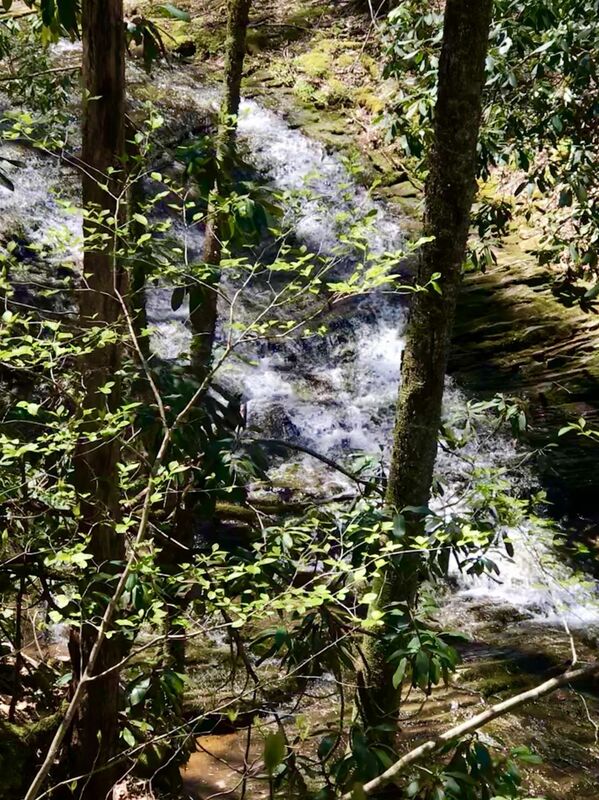 get lost and/or injured when they attempt to hike to the Bathtub in poor weather conditions, without enough daylight remaining, or without proper experience or preparation. In short, this is NOT a good choice for a first backcountry hike. 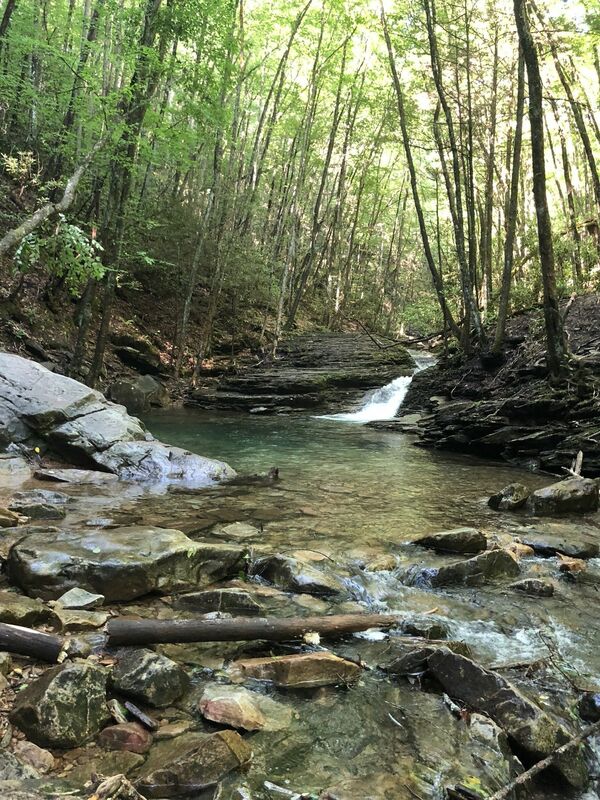 Always hike at your own risk, and consider taking some easier hikes in the area first to become familiar with the demands of backcountry travel if you are inexperienced. 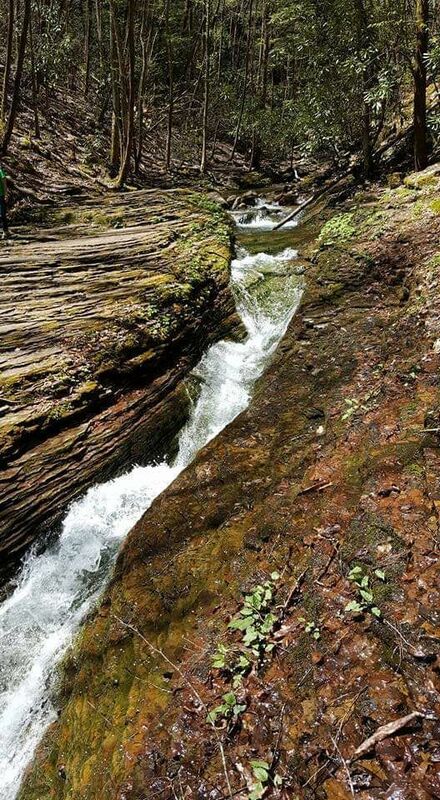 Above all, be smart and come prepared when attempting this trail. If you don't know what good hiking preparation entails, it may be best to choose an easier hike. 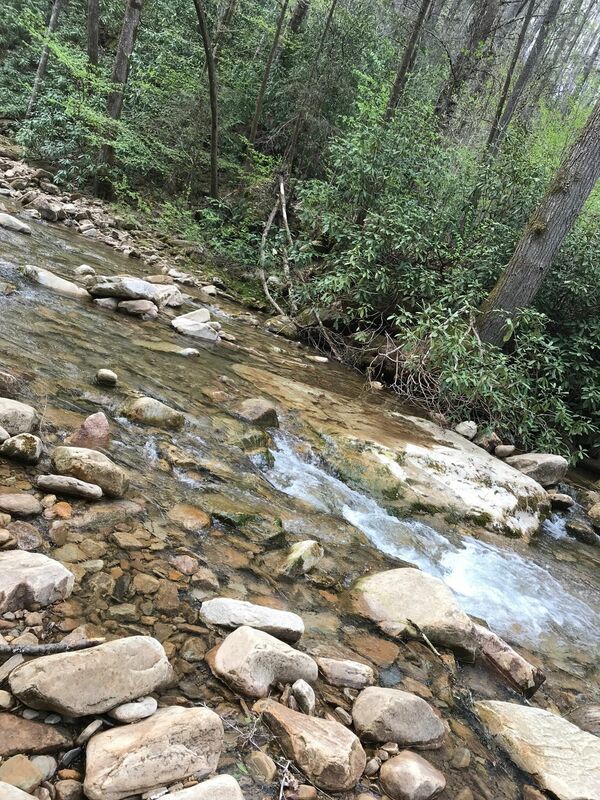 - While often easily navigated, the multiple stream crossings on this trail may require significant wading at high water and may even become treacherous during extremely high creekflow. Even at low water levels, some creek crossings are technical and cannot be made dry-shod. Use caution and good judgment before attempting any creek crossings in wet weather. - Steep terrain and heavy forest cover along this trail may prevent adequate wireless internet access and/or reduce accuracy of smartphones' GPS while on the trail. Your location on the map may therefore not be precisely accurate if tracking your progress directly on the trail. As with all online guides, the information contained herein should only be used for educational purposes and not for use in backcountry navigation or as a substitute for a trail map, planning, and good judgment. Directions from Fort Blackmore, VA: Head northwest on Rt. 619. Travel approximately 3 miles to the trailhead. 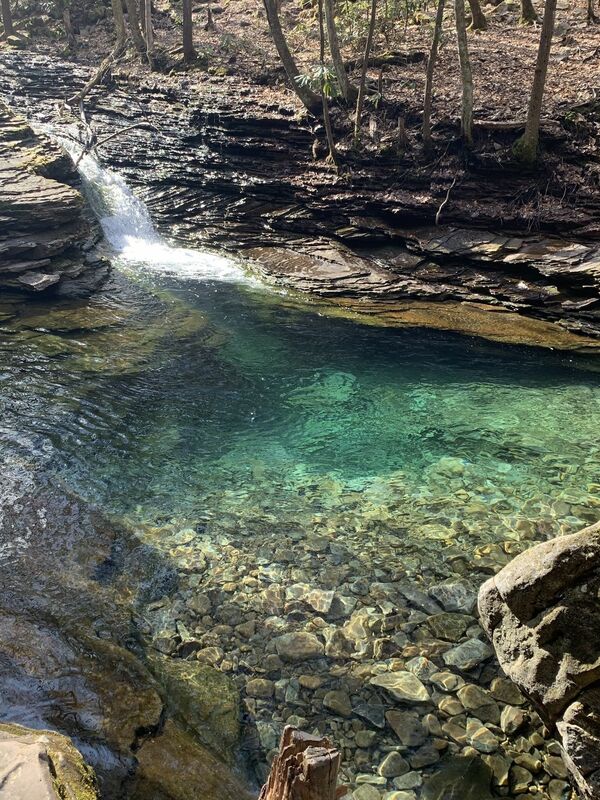 Absolutely incredible hike, long but simple, one of my favorite in all of VA.
Worth the hike at the end. It’s a difficult trail to walk, definitely wear shorts to your knees and water shoes. 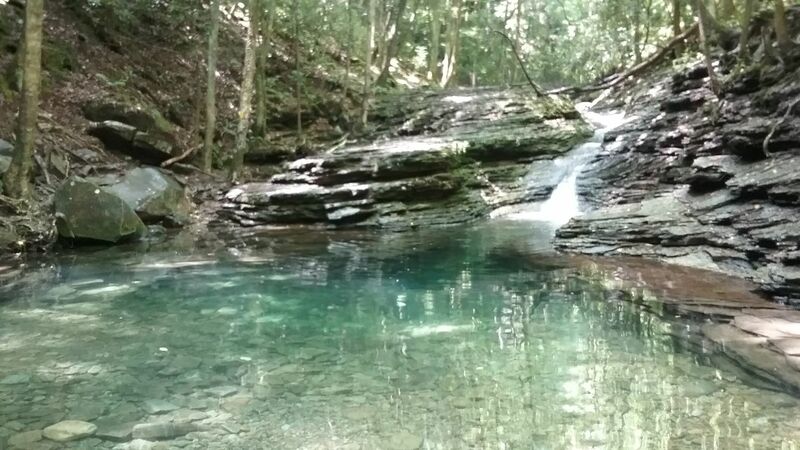 It’s very difficult to get to the devil bathtub it’s self, there’s a swimming hole that’s very pretty and you can see straight to the bottom. It’s tough but worth it. We had a wonderful time, lots of water crossings a good challenge. Parking was interesting overall Great experience. so worth it! started with the straight up first, so we could "finish" at the devil's bathtub. hardest, most worth it trail of my life! can't wait to do it again! Hiked this in December, took the counterclockwise route as suggested. There were 10-12 stream crossings that were very challenging. A few of them can be navigated just staying on dry portions of rock, but most had rocks that were just too far apart to take a step. 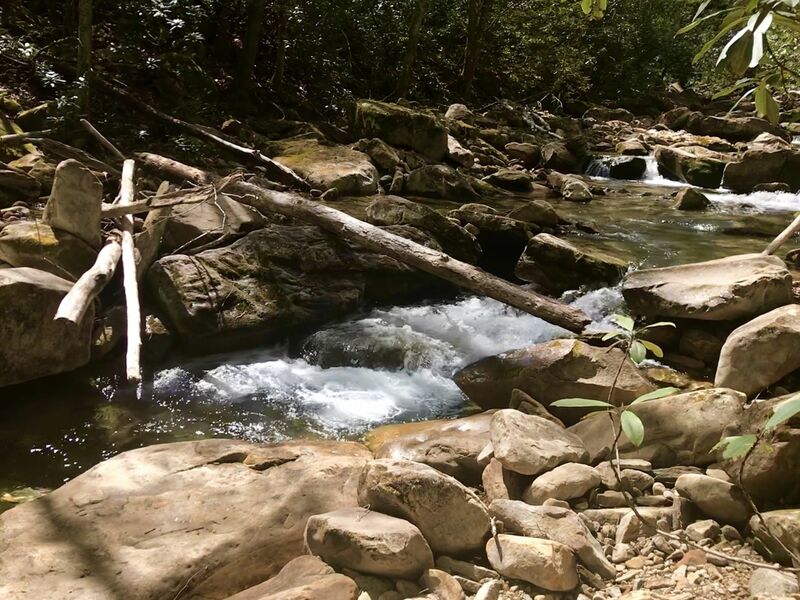 Solutions include bushwacking off the trail to find a better spot to cross, shimmying across fallen logs, or just take off your shoes and trudging through the ice cold water. 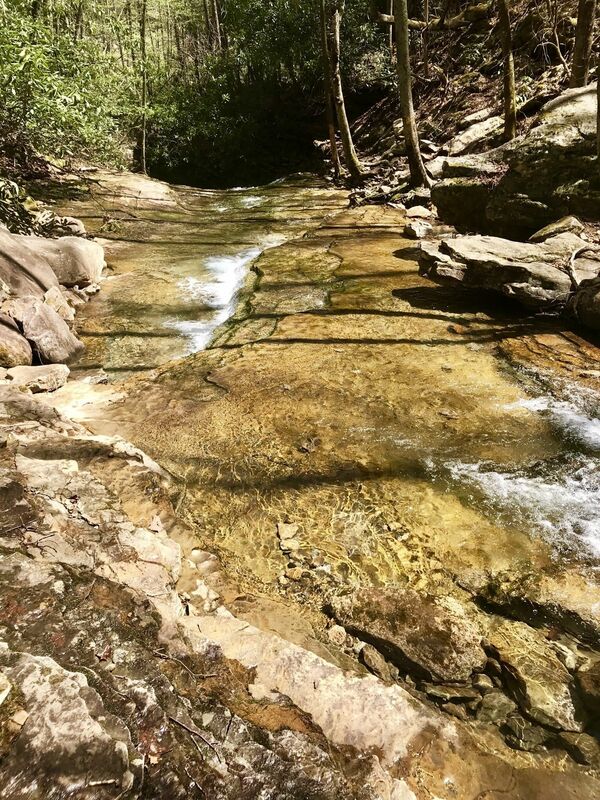 Aside from the initial stream crossings, the hike is not very challenging beyond Devil's Bathtub. There is a sign saying something like "Warning: next 5 miles very strenuous and rugged", but it was a relatively easy walk through the woods compared to the first part of the trail. First 2-3 miles took 3 hours, remaining 5 miles took 2.5 hours. Overall it was a lot of fun; navigating the stream crossings added an element of challenge and decision-making. Great experience. Crossing the creek multiple times can be challenging due to slick rocks. 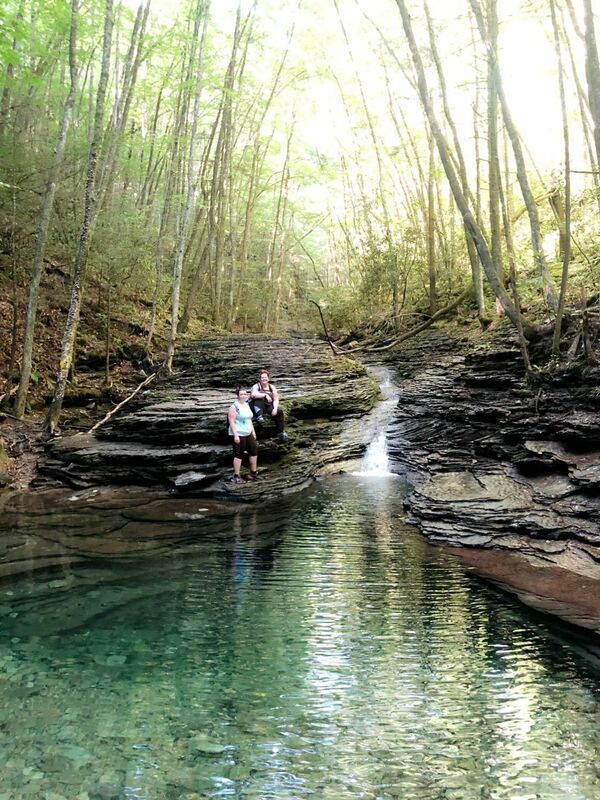 The entire 7.5 mile loop that includes the Devils Bathtub was fairly strenuous. I hiked the back 5 miles first and then descended the mountain and made it to the bathtub. The first 2-3 miles were fairly difficult and elevated but once on top of the mountain fairly easy going. Trails are rustic and at some points wild. Keep eyes on the trees. The park has marked the trail with yellow markers following the path on the trees. I got turned around several times and had to back track to make sure I was going in the right direction. The bathtub was very interesting and would probably have been better if I didn’t make it there right around dark. I recommend you doing the hike earlier. On the way back from the tub (2 miles to the parking lot from this spot) you will have to cross about 10 different places on the main stream. Prepare to get wet! Overall, the trail was the type of hiking I enjoy. More of a back country feel. 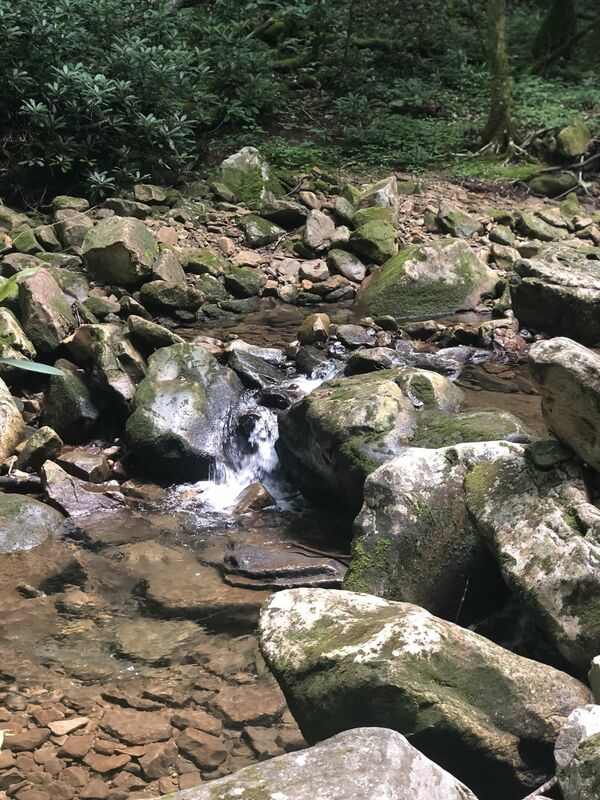 Feel free to bring dogs (it is pet friendly) but I recommend bringing animals that have experience going up and down steep hills with rocks and streams. The trail needs some work put into it. A few parts need guardrails and steps. The falls are pretty though. Amazing wildlife! We saw 3 small wolves scampering around, deer, and accidentally walked a few feet from a rattlesnake! We went counterclockwise around the loop, reaching the bathtub at mile 5. The first 1.5 miles were super steep, but all pretty easy after that. The bathtub was gorgeous. We went on a weekday and saw no one on the trail until we got past the bathtub and saw people doing the 4 mile out and back hike. You have to hop over rocks but it had been dry for a week or so and I didn't feel like I ever had to put on the water shoes I brought. definitely go on a weekday- I can see it being kinda cramped and miserable with a whole bunch of people. Breath taking beauty! Take your time to enjoy with safety first!! Take your litter back with you!! Moderate to some extreme levels of hiking. Prepair to get wet at the most knee high. As you will have to cross about 6 streams. Hiking stick is a great plus for stability when unknown unstable rocks and boulders as crossing small streams can turn into injuries. We saw three bathtubs leading up to the small narrow 17ft deep oval shape bathtub. I only had time for the part of the loop for the devils bathtub. Stay to the left and if you’re unsure of the trail just walk up the creek bed until you see a yellow blaze. The trail had lots of different fungi to identify and the crossings were not difficult because there wasn’t a lot of water, my shoes stayed dry most of the time. There was a rescue while we were there (jumping from ledges that should not have been jumping from). 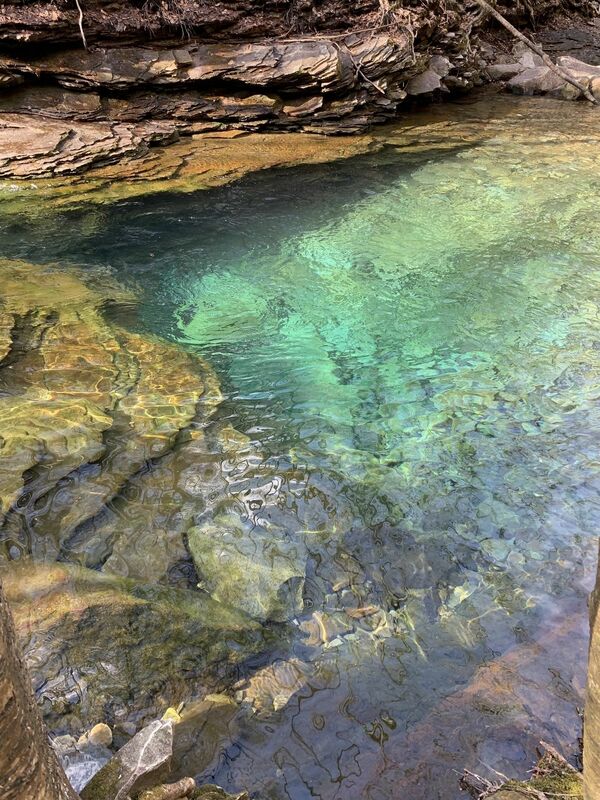 The water was bee refreshing and devils bathtub was probably 8 feet deep and clear to the bottom. Not too many people but lots of trash. Please bring a bag to carry out what you can. I’m 100% going back! The hike took about an hour ( my 66 yr old dad & 11 yr old daughter made it in 45 mins). 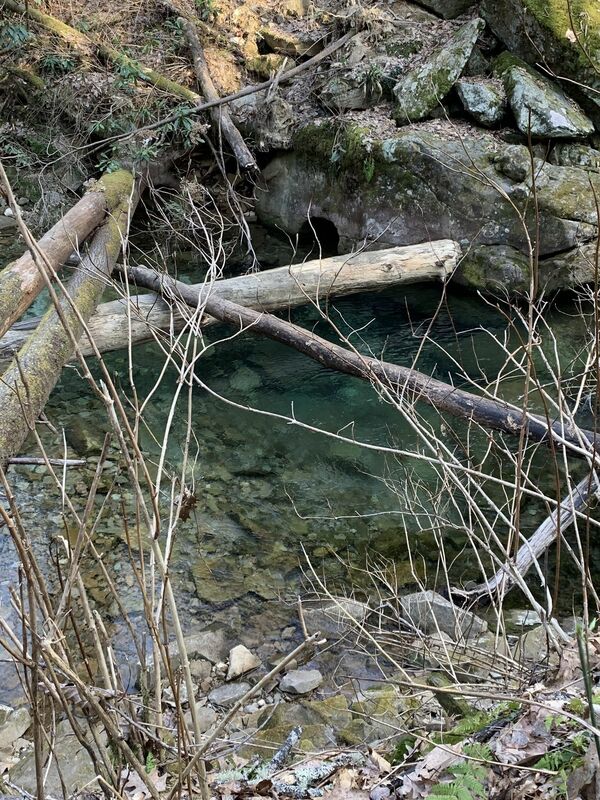 The swimming hole below the Bathtub & the Bathtub is some of the clearest & coldest I have seen/felt. Absolutely beautiful & worth the hike. The main attraction is the bathtub but if you continue it's more rugged. More than I expected. 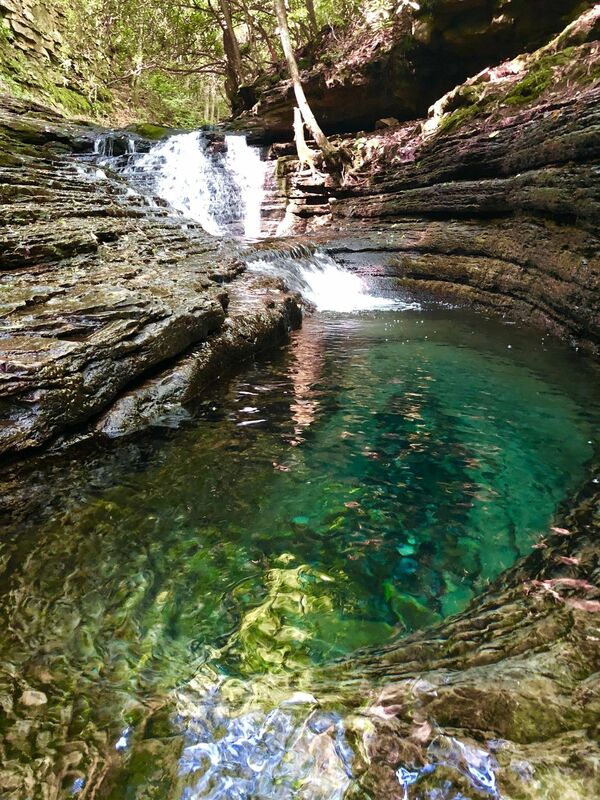 Also, the water will literally take your breath away if you jump in. 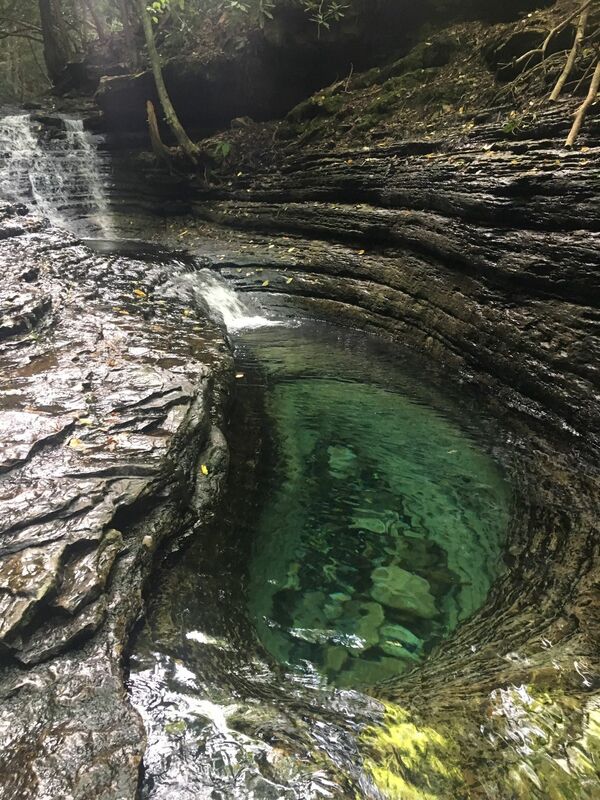 The Devil's Bathtub has been on my list to hike for over a year. We hiked it last Friday, arriving at the trailhead parking lot at 9:30 am. At that time, we were the 3rd car already there. At 1:00 when we arrived back to our car, the road leading into the trailhead parking lot was lined with cars parking. We took the advice of going on a weekday and starting as early as possible. 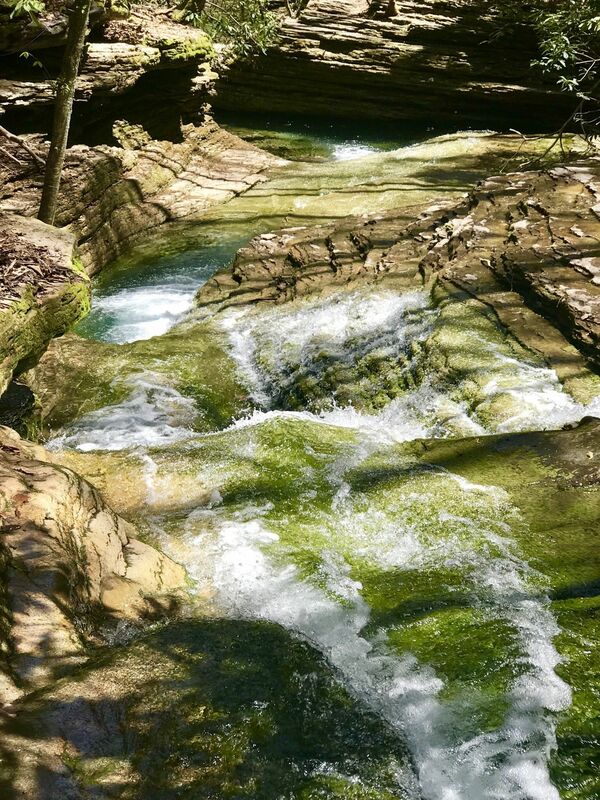 The hike is beautiful with 13 creek crossings on the way to see the bathtub. Most of them were shallow being about ankle to mid calf deep while 2 were just above knee deep. I would recommend watching how much rain is happening in the area before heading out. 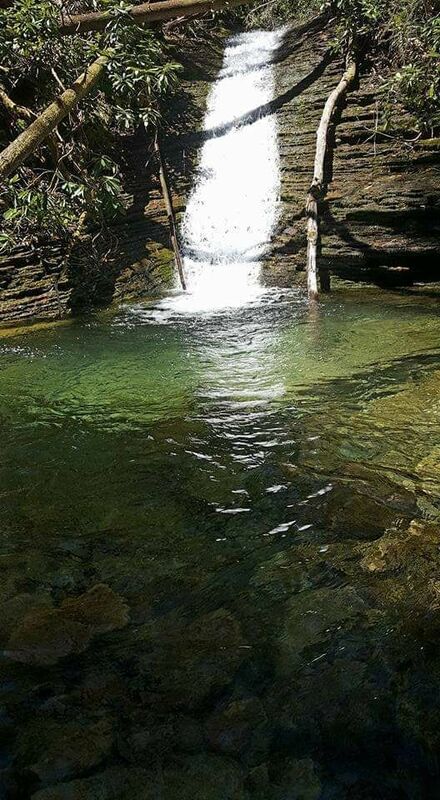 Before the actual bathtub is a waterfall flowing into a beautiful pool, the bathtub is on past this and is worth the drive and the hike to reach it. It is absolutely beautiful. 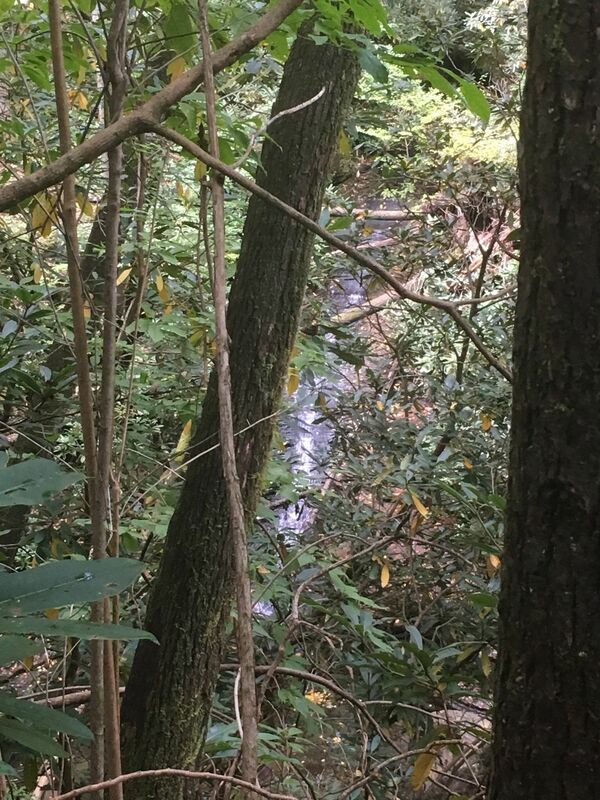 I had spoke to the forestry service the day before to check trail/creek conditions and was told they had just had a trail clean up, so we did not see much trash at all. Also, a vehicle that sits higher off the ground is recommended to reach the parking lot. I was advised a 4x4 but drove my front wheel Outlander and made it. Very Rocky trail for a good bit even when you aren't in the water. Very poorly marked in spots. When in doubt, cross the river, just remember that doesn't always mean STRAIGHT across. Sometimes its a diagonal cross or even just short hike up the river itself. You will get wet at least up to the knees! But so beautiful once you get there! 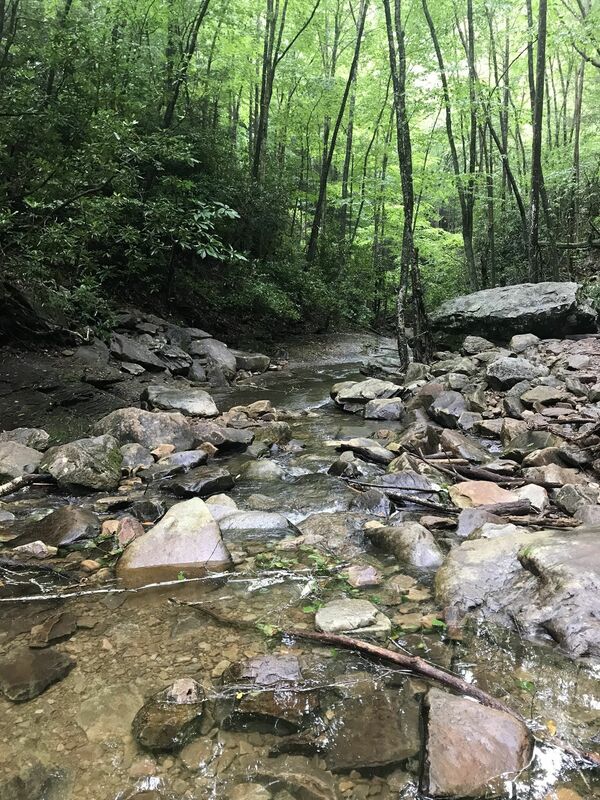 After 2 days of hiking in the Smokies, this trail in a rural area of southwest Virginia was the highlight of my trip. Love the water crossings for opportunities to cool off on a hot day. 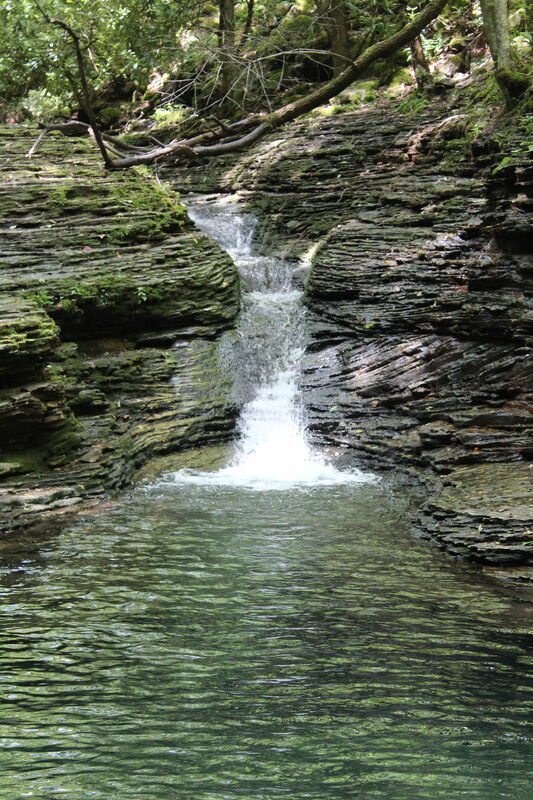 The hike to Devil's Bathtub and back takes less than 3 hours and that is with time spent at swimming holes. 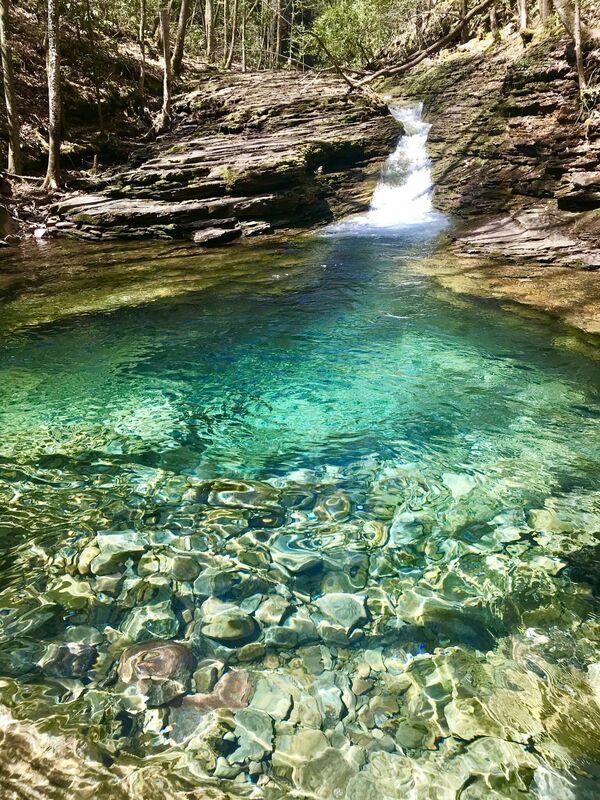 Just below the bathtub is the best swimming hole I've ever been in north of the Florida-Georgia line. The only thing I did not like is seeing all the garbage and personal belongings (socks, towels, etc) that disrespectful hikers left behind. Definitely a tough hike, especially counterclockwise ending with the bathtub. Bring some shoes with good grip, there’s plenty of stream crossings and you are bound to get your feet wet. A word of advice for those planning to do the whole loop, don’t go after a recent rain storm. There is so much mud on the trail that my feet were getting sucked into the ground making the climb so much harder. Lastly, please follow LEAVE NO TRACE; there were piles of garbage scattered throughout the trail closer to the bathtub. Worth the trip. The water is ice cold. The trail markings are piss poor in several spots. I learned really quick it's better to just cross the stream and not try a way around it. Kinda hard to get to, especially if you are not an avid hiker. But oh so worth it when you see it. Beautiful & always worth the trip! I lve the cold water after working up a sweat getting there! The difficulty is well worth it and with the loop you can get all you want out of a good day hike. 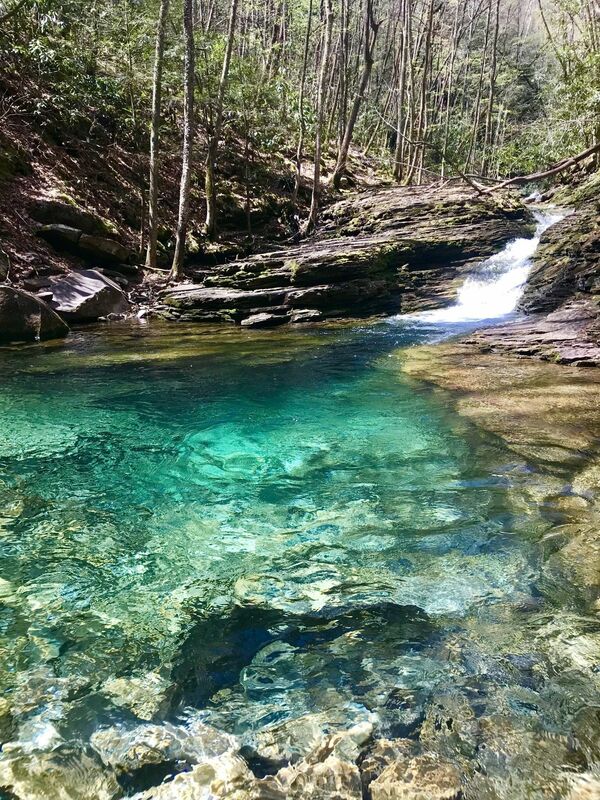 Swimming holes are pristine. Only complaint is that weekends are wayyyy too crowded. 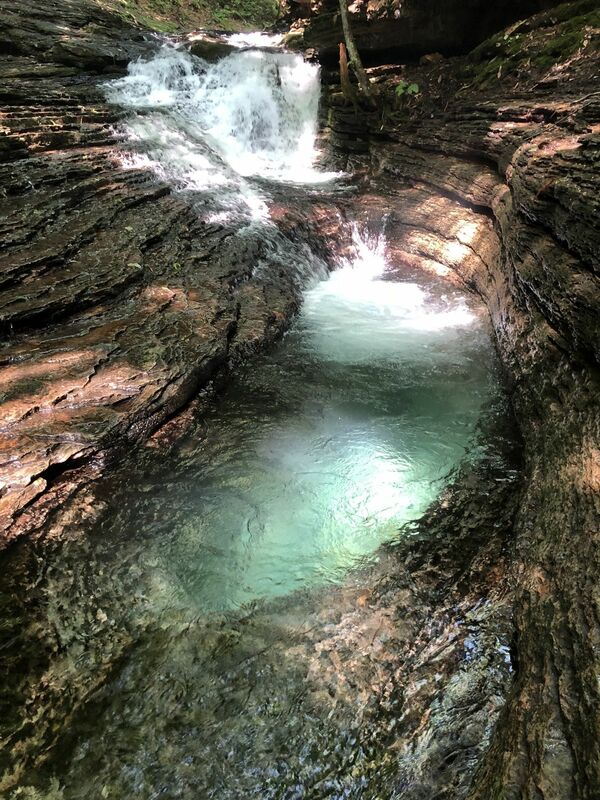 One of my favorite hikes! So beautiful!! There are some parts that are harder then others. Make sure you wear the correct shoes bc your feet will likely get wet. We had the parking lot and trail all to ourselves! The water levels were pretty high but everything was beautiful! We hiked the entire loop. The first 3 miles are definitely the most scenic. Very scenic trail with at least a dozen stream crossings. So do not recommend after a heavy rain, the high water makes navigating across some spots a little difficult. But on normal does u can step stones across most places. 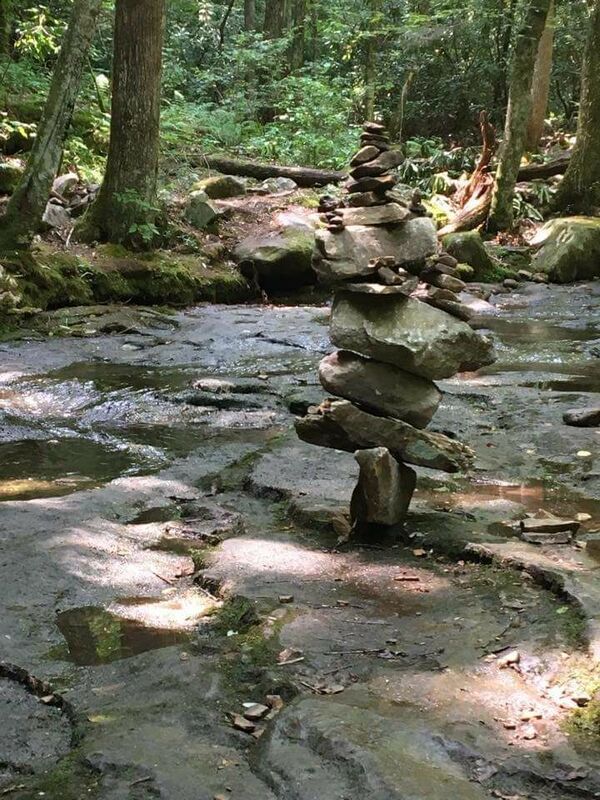 The trail it's self isn't to hard my 8 year old daughter made the hike. 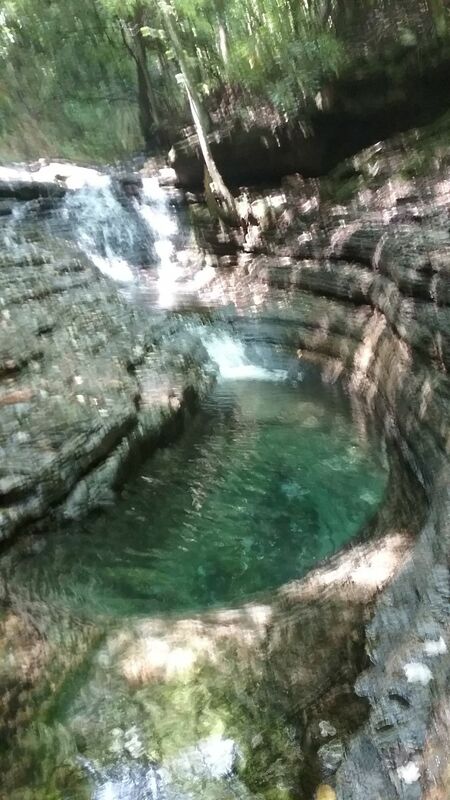 When you reach the Devil's bathtub it is beautiful and offers a good size water hole below it, which is good for cooling off on a hot day. So pack a swim suit.